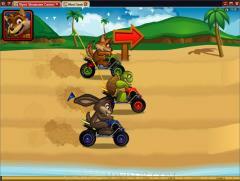 Mad Dash has a rough terrain racing theme which is conceived with a comic touch. The contestants in the race are the proverbial Tortoise and Hare. To add spice to the proceedings the sly Fox is also in the race. These three characters appear as symbols on the reels. The other symbols are the high value cards from Ace to Jack. These have been crafted as brightly colored checkered flags. The wild symbol is the Mad Dash Logo. It offers the highest fixed payout of 2000 coins. The golden Trophy is the scatter symbol. 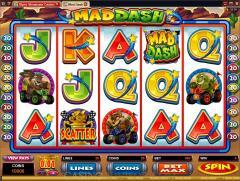 The number of symbols in Mad Dash is fewer than what is generally prevalent in five reel video slots. However the symbols exude energy that would be associated with a race. 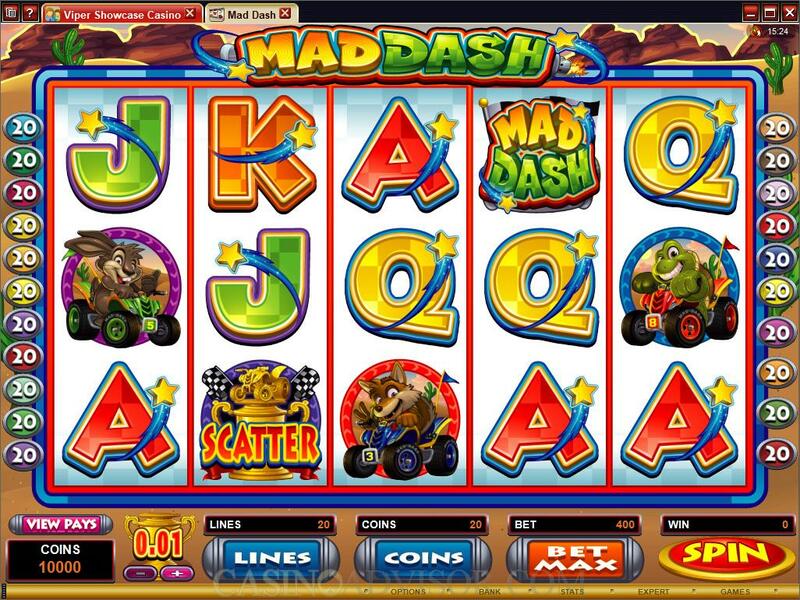 Mad Dash is a five reel 20 payline slot game. Players can wager up to 20 coins per payline and the coin size varies from 0.01 to 0.25 with a total of six stops. The maximum bet per spin works to 400 coins or 100.00 credits. Most players will play with all 20 paylines enabled. But because of the flexibility in the number of coins and the coin size, Mad Dash can cater to a wide range of bankrolls. The Trophy symbol offers scatter payouts when two or more appear anywhere on the reels. The maximum scatter payout for five symbols is 200 times the total bet. Three or more Trophy symbols anywhere on the reels trigger the Mad Dash Bonus Feature. This feature is a combination of a bonus game on the second screen and a free spins bonus round. The bonus game on the second screen is played first to determine the number of free spins. The player has to make three selections. In the first selection he chooses the character from the Tortoise, Hare and Fox to represent him. Then he has to choose the ride that the chosen character will use. Finally he has to choose the terrain on which the race will take place. Based on the selections made the race is run. The position of the player’s chosen character determines the number of free spins. If the character wins then the player is awarded 25 free spins. If the character comes second then the player is awarded 15 free spins and if the character comes third then the player is awarded 10 free spins. All free spins payouts are multiplied four times. The free spins can be retriggered but the race is not played again. The same number of free spins is awarded. Mad Dash can be played in the Expert Mode that has a comprehensive Auto Play Feature. 5 or 10 auto spins can be activated directly. For a larger number of auto spins players have to use the set up menu. The set up menu enables activating conditions that can abort the auto play prematurely. Interested in reading more detailed information about Mad Dash? If so Click Here for more details.